227 pages | 192 Color Illus. The digital revolution over the past several decades has advanced every facet of evidence detection, photography, optimization, and interpretation. Forensic scientists and practitioners have benefited tremendously from the move from film to digital. With proper procedures in place, digital images and casework capabilities have increased tremendously in both complexity and range due to a vast array of tools to enhance evidence and photography. Forensic Digital Image Processing: Optimization of Impression Evidence provides the forensic investigator with the tools and understanding to extract, optimize, and interpret the maximum evidence possible from crime scenes to increase identifications. The book begins by examining the emergence of forensic digital image processing, and the gradual improvement and acceptance of the science over the past four decades. Coverage includes looking at the issues of image integrity and authentication including forensic image optimization and the manipulation of images. Chapters explore techniques exploiting color theory, modes, and channels to optimize signal-to-noise ratio in images. One of the greatest assets of digital image technology is the ability to combine multiple images of the same subject to create a final, blended image: one that displays the desired evidence and is especially useful for fingerprint or footwear impression. Later chapters demonstrate image subtraction, focus stacking, and high dynamic range, utilizing images in optimum focus and with substrate interference diminished or removed entirely. The authors look at fast Fourier transform as an optimal tool for noise removal, addressing basic theory and diagnosis of the noise signatures. The book discusses the history of digital imaging techniques and their treatment within the court system. 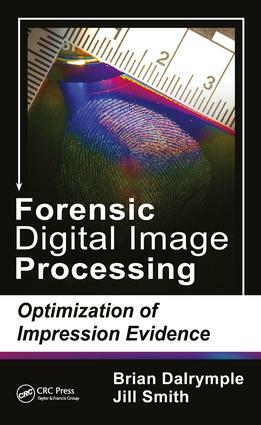 Forensic Digital Image Processing: Optimization of Impression Evidence serves as an invaluable resource and tool for practicing professionals–as well as those new to the field—to look at best practices, the latest technology, and advances in utilizing the increasing array of tools of the trade. Brian E. Dalrymple, CLPE began a career in identification in 1971 with the Ontario Provincial Police, Forensic Identification Services, Canada. In 1977 he co-developed the technique of evidence detection with argon lasers through inherent fluorescence and became the first in the world to operate a laser for evidence detection in criminal cases. The extensions of this technology are now in global use and have provided pivotal evidence in hundreds of major investigations. In 1991, as Associate Section Head, he introduced the first Computer Evidence System to Canada, and later became the first Canadian to tender expert evidence in this emerging technology. In 1992 he was promoted to Manager, Forensic Identification Services, a position he held until his retirement in 1999. He initiated and co-wrote the Body Examination Protocol for the Province of Ontario, regarding the examination of murder victims for fingerprints on skin. Brian Dalrymple has taught extensively in North America, China, the Middle East and Australia. He is the recipient of the John Dondero Award (1980, IAI), the Award of Merit (1980, Institute of Applied Science), the Foster Award (1982, the Canadian Identification Society) and the Lewis Minshall Award (1984, the Fingerprint Society, UK). Brian has been a contract instructor for the Ontario Police College for more than a decade, and provides forensic consulting for police agencies, attorneys and the corporate sector. With Ron Smith & Associates, he is a consultant and staff instructor working as part of a team forensic experts. He is an Adjunct Professor at Laurentian University in the Forensic Science Department. Jill Smith is an Imaging Specialist with the York Regional Police in Ontario Canada, working in forensic computer image analysis enhancement for fingerprints, footwear, bite marks, and other evidence. She keeps up on the latest technology and trains others in Adobe Photoshop techniques. Jill was a guest lecturer at the Ontario Police College for ten years and had co-taught fingerprint technique courses with Brian Dalrymple. She has been published in industry journal publications including several times in the IAI’s Journal of Forensic Identification.